Be the first to share your favorite memory, photo or story of Bryce. This memorial page is dedicated for family, friends and future generations to celebrate the life of their loved one. Bryce Allen Hosey-Coffey was born January 28, 2019, at 9:52 p.m. but immediately met the eyes of Jesus. Bryce was born after a full-term pregnancy to the loving parents of Larry Coffey and Tiffany Hosey of Ripley, WV. Family and friends surrounded baby Bryce immediately upon birth and cherished the time they spent holding this precious baby boy. Bryce is predeceased by his grandpa Junior Hosey of Kenna, WV. He is survived by his maternal grandma Faye Hosey of Ripley, WV; two uncles, Jacoby Hosey and Anthony Cummings, both of Ripley, WV; maternal great aunts Patty Hosey and Ruth Parsons, both of Ripley, WV; maternal great uncle John Parsons of Ripley, WV. 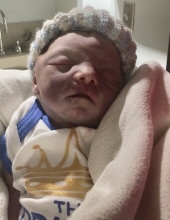 Bryce is also survived by his paternal grandma and grandpa of Kenna, WV; three paternal aunts, Carrie Harper and Crystal Sigmon, both of Kenna, WV and Kim Nichols of Ripley, WV, as well as many cousins and family friends. Waybright Funeral Home has generously donated their services and the family is forever thankful for the generosity in assisting as they lay their baby to rest in his final resting place. Bryce will be buried at the Liverpool Cemetery in Leroy, WV. Visitation will be Friday, February 1, 2019 at the Waybright Funeral Home, Ripley from 10 am to 11 am. Funeral will immediately follow the visitation service with Pastor S. R. Parsons Jr. officiating. To plant a tree in memory of Bryce Allen Hosey-Coffey, please visit our Tribute Store. "Email Address" would like to share the life celebration of Bryce Allen Hosey-Coffey. Click on the "link" to go to share a favorite memory or leave a condolence message for the family.